Chickens are exposed to eye worms by eating cockroaches infected with the worms. The cockroaches eat chicken droppings full of worm eggs that hatch inside their bodies and become larvae. The chickens then eat the infected cockroaches. The worms migrate up through the chicken's esophagus and up through the ducts to the eye. These worms swim underneath the chicken's eyeball. Treat eye worms in chickens using prevention methods and medical intervention. 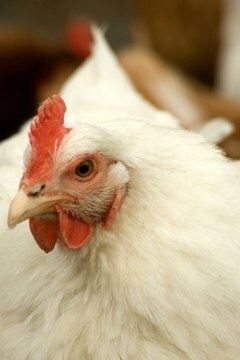 Symptoms of eye worm in chickens include swollen, watery eyes and eyelids that stick together. Pus forms in the corner of the eye where the worm is living. Check the corner of the chicken's eye for visible worms. The chicken's vision becomes impaired without proper treatment. The bird begins to scratch at the infected eye with the tip of its wing. Chickens with severe cases of eye worms might scratch at the affected eye so much that they scratch the eye out. Eye worms in chickens are mostly treated by a medicine called VetRx. VetRx is available at feed stores. Add 1 tsp. of VetRx to one cup of very warm water. Administer the treatment to the chicken by holding the bird under one arm. Open the chicken's mouth, and turn the bird down so the cleft in the roof of the mouth is in plain view. Dab the end of a cotton swab into a warm VetRx solution, and apply it directly to the cleft. VetRx will come from both sides of the beak, and pus will drain from the eyes. Clean the pus from the chicken's eyes and allow the bird to rest. Repeat until the chicken is free of eye worms. Veterinarians remove eye worms by first administering a local anesthetic. The doctor holds the chicken's head rigid and inserts the tips of dull-pointed forceps beneath the nictitating membrane of the eye, which is the thin inner eyelid of the chicken. The veterinarian continues this procedure until all visible eye worms are removed, then he adds one or two drops of Cresol solution. The eye is flushed with warm water to remove remaining debris. Prevent eye worms in chickens by sanitizing their living area, cleaning and disinfecting the area on a regular basis. Place the chickens on wire placed above ground level to keep the birds from being exposed to cockroaches and contaminated droppings. Control the cockroach population using pesticides approved for use in areas where chickens live. Separate chickens by age group, because older chickens may carry parasites and display no symptoms. Keep them separate from other poultry. Watch closely for signs of eye worms, and seek treatment immediately to prevent blindness in the chickens. University of Florida IFAS Extension; Nematode Parasites of Poultry; R.D. Jacobs, et al.